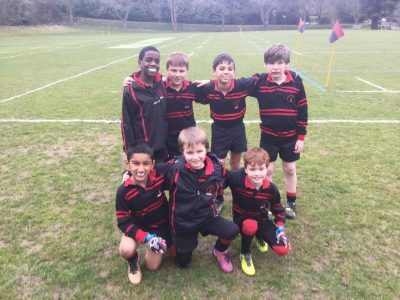 Anyone who was lucky enough to watch the U8A tag game against Caterham on Tuesday afternoon would watch a game where the age of the players defied the high quality of the game. Even though the result didn’t go the boy’s way, they arguably played the better rugby, scoring some excellent tries that would have been applauded in any rugby game. Even the watching Caterham parents could not help but admit that Copthorne played some brilliant rugby. The first half was an extremely tight affair with neither tame making any mistakes in the entire 12 minutes. Scores were traded with some impressive running and passing from both teams. Caterham had some great players of their own and the boys did well do make a number of tags to keep them at bay. The second half was just as close as the first but Caterham picked up their defensive game and tagged Copthorne out twice and scoring in the following play themselves to take the lead. Copthorne battled back with tries of their own as the Caterham defence started to crumble but they just help on for a narrow victory with time running out as Copthorne continued to press for a try to equal the scores. If the boys play in the same way on Wednesday at the tag tournament at Windlesham they stand an excellent chance of going a long way in the competition. The game was a testament to how far all the boys have improved this half term and they should be proud of their efforts. Well done. Team: Freddy G, Rohan G, Harry A, Charlie A, Tobi A, Taran S, Oliver W.